this is my new friend, herman. 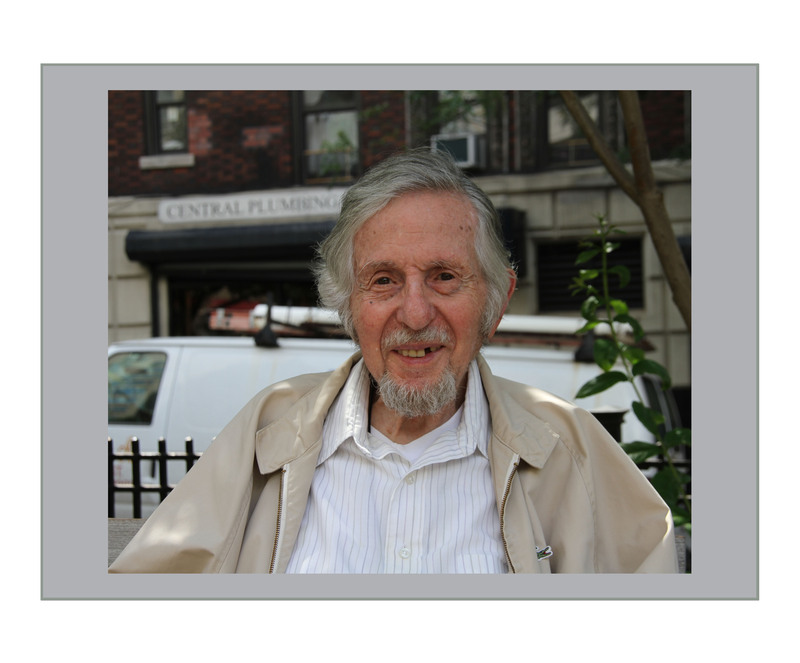 herman is a self described “nice jewish boy from the bronx” and he was born in 1918. i met him a few weeks ago in a little park that divides the north and southbound lanes of park avenue at 96th / 97th streets. i was waiting for a phone call before descending into the ‘no cell service zone’ at the 96th street train station, and the park seemed like the perfect place to catch a few rays while waiting. at approximately 3:00 herman walked into the park. the instant i saw him, i knew i wanted to meet this man. his eyes sparkled and he was so obviously full of interesting stories. herman settled on a bench opposite me. he seemed so content. after several minutes i began to walk around the little park and photograph some of the freshly bloomed hydrangeas. i really wanted to photograph herman but thought he might find it a bit disconcerting for a complete stranger to be taking his picture. “no, but i would like to take your picture”, i said. he smiled and asked me what i would do with a picture of him. i said if he let me interview him, i would put his picture on my blog along with the information he provided in the interview if he was willing to tell me a bit about his life, to which he agreed. herman began by telling me about december 7th, 1941. he had recently graduated from law school at columbia university and was reading in the columbia law library when the librarian approached him and gave him news that the japanese had bombed pearl harbor. being a “nice jewish boy from the bronx”, of course, the first thing herman did was to call his mother. he realized right away that he would be drafted so rather than wait for the call, herman went directly to the government office and signed up for his military duty. he was immediately sent to georgia for his first round of training and then on to texas and london for more. herman’s dad spoke german at home and therefore herman spoke the language fluently. he was ready to defend the u.s., armed with brains and german fluency, so they sent him to germany – which had to be quite scary for a nice jewish boy from the bronx. i asked herman if he was scared. he responded by telling me that the nation was at war and he was willing to do what needed to be done to defend his country even if he had to go to germany to do it. i didn’t say anything but i was scared for him. he had no idea how long he would be gone or, i suppose, if he would even return at all. herman left his girlfriend, asked her to move on with her life and went off to fight the nazis. herman worked directly with the germans and devised reports on the effects of bombings in german towns. the goal was to maximally damage the forces of evil with minimal damage to innocent people. he collected information from the german people and used it to recommend bombing strategies. herman knew he would ultimately be responsible for bombs that destroyed the homes and towns of the very people he was talking to. i cannot think of a tougher job but herman had to keep focused on the higher good and protect the people he loved back home. our conversation weaved it’s way back to new york where herman ultimately practiced general law at his own firm. i have so many more questions for herman. he has over 93 years of stories to share. today i will go to the park on 96th street and wait for herman to arrive at 3:00. This entry was posted in humor and tagged NYC, photography, wonderful people. Bookmark the permalink. thanks, ron – i’ getting ready to go to 96th st. to find herman for part two! Brilliant piece, it is amazing when you have the opportunity to learn about history from those who lived it and of how little we really do know about our past. Looking forward to the next installment. thank you! herman wasn’t in the park today – i’ll try to find him in the next several days so that i can do a part 2! well, my friend herman wasn’t there yesterday – but i hope to catch him next week!